Whether you like a morning wake-up call, an afternoon delight, or a nightcap before bed, the “best” time of day to exercise really comes down to one thing: YOU. There are countless articles and studies about “the best time of day to workout.” With half the camp on the morning side and the other half on the later in the afternoon/evening side, it’s hard to know which one to believe. And while they both have research to support their arguments, the one thing most people can agree on, is the best time of day to exercise is the time you are most likely to make it a regular, consistent part of your life. Yeah, yeah … I hear it all the time: “But it’s just too hard to get out of bed in the morning.” If you are just beginning a workout program or are able to adjust your current schedule to accommodate the morning hours, you might want to consider getting up an hour earlier and sweating it out before you get on with your day. The physical and mental benefits are endless and once you make it a habit, you will look forward to getting out of bed and starting your day this way. But before you hop on the morning bandwagon, take some time to come up with a plan of attack so you don’t end up sabotaging your plan before you even start. Simple things like laying your clothes out the night before, having your work clothes and bags ready to go, putting your alarm clock as far away from your bed as possible, and even sleeping in your workout clothes, can all make the difference between getting it done or staying in bed. If you are someone who wakes up with headaches, a clenched jaw and anxiety because you’re already thinking about work, then sweating it out before you punch the clock is a great way to clear your mind and alleviate extra stress. Most gyms and fitness centers report peak user times as 5 to 8pm. Therefore, gyms and the outdoors are usually less crowded during the morning hours because people want to get in and out ASAP. If you workout at home or outdoors by running, walking, or biking, sometimes all you need is an extra 30-45 minutes in the morning to get your exercise in. Think about how many times you forgo your workout later in the day because you keep thinking about all of the other things you need to do. Exercising in the morning eliminates the excuses. People who exercise in the morning tend to make healthier choices throughout the day to complement the hard work they’ve already done. Getting up and working out not only makes you feel better physically, it also gives you that extra boost of confidence knowing that you got it done. Fitness fanatics who swear by the later in the day workouts, claim they reap just as many benefits, if not more, as the early risers. For people who can’t get going in the morning or who simply prefer working out later in the day, check out some of the positives to sweating it out later in the day. If you are someone who needs to “clear your head” before you head home from work, exercise is one of the best ways to relieve stress and shake off the energy from the day. People who prefer the after work regime, find a sense of comrade and friendship with their workouts. A running group, pick-up basketball game, spin class, CrossFit class, or just lifting weights together, helps with better adherence to an exercise program—especially if you know there is someone waiting for you to show up! If you are not rushing to get through your workout and showered up for work, you can take the time to get to all of the exercises on your list and be more physically prepared to challenge your strength. 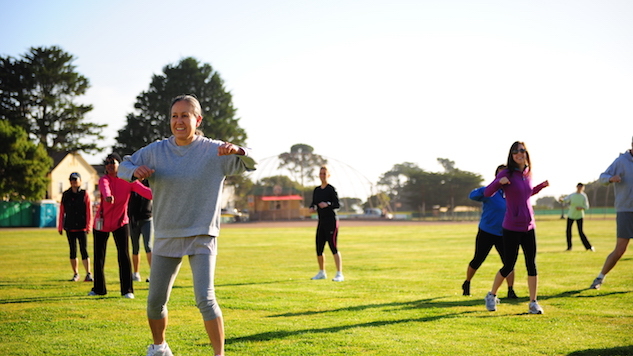 Many gyms and fitness programs have more classes and opportunities available in the late afternoon to evening hours, which makes it more appealing to go and join in.